Recreate useful items made during colonial times with easy craft projects. Many colonial crafts are simple to make because they were created by the average person using materials readily available during this time period. Adults should supervise children when using knives or other sharp instruments to create crafts or perform the necessary cutting for them. Make a colonial air freshener using natural ingredients. Use an apple or a citrus fruit such as an orange, grapefruit, lemon or lime to make your pomander ball. Poke holes into the fruit with a toothpick and insert a whole clove into each hole. Cloves are pointed at one end so push the pointed end into the fruit, leaving the round end of the clove on the outside of the fruit. You can create a pattern of cloves on the fruit or insert them randomly depending on your personal preference. Roll the clove studded fruit in a shallow dish of cinnamon, allspice or any type of fragrant spice. The pomander ball may be hung as is by tying colorful ribbons around the fruit and hanging it in your home. If you would like to extend the life of the pomander ball, place the fruit in a warm, sunny place. The fruit will dry and shrink in the sun during this time. Once the fruit is hard and dry, you can hang it in your home without fear of it rotting. Craft simple dolls out of corn husks as children did in colonial times. Dried corn husks can be purchased at craft stores or in the produce section of some supermarkets. Layer together four to six corn husks and fold the stack of husks in half. The folded part of the corn husks will become the head of your doll so tie a string around the husks 1 to 2 inches below the fold to form the head. Peel up one or two layers of corn husks on each side up the to string. Tie string around these layers to form the arms of your doll. The remaining corn husks may be left as is to form a skirt for the doll or separated into two legs and secured with additional string. Tie additional corn husks around your doll to form clothing. Add color or facial features to the dolls with fruit juices. Quill pens were used from the 1700s to the 1800s and these pens were formed from feathers dried out to remove natural oils and sharpened to a point. 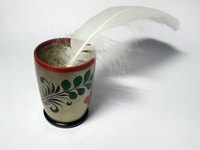 You can make your own quill pen using natural feathers from craft stores. These feathers are already dry and ready to be sharpened. Place the feather on a cutting board and slice away the tip of the feather's shaft to create a point. Use the pen by dipping the point into ink and writing on paper. Experiment with cutting the shaft at slightly different angles to produce different results in your writing.